Swift Lightweight Self-Propel Wheelchairs use high quality aluminium frames for low weight and strength, and they can be folded and dismantled very easily, for storage or transport from place to place- they are a great choice for those who need an occasional wheelchair that has all the features from puncture-proof tyres to flip-up armrests. These Swift wheelchairs are compact and manoeuvrable, great for negotiating shops, restaurants, and other tight spaces. The upholstery is nicely padded for comfort, and you can choose from two seat widths (the 16 inch is particularly handy for smaller users). Seat Width…. 41cm / 16” 0r 44cm / 18"
Seat Depth…. 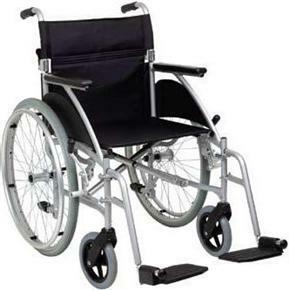 42cm / 16"
Very happy with this wheelchair , lightweight and quick delivery . Would definitely recommend.